Maja Parfum 100 Year Special Limited Edition Celebrating 100 years of Maja to the world! The very famous Maja Soap, box of three round soaps, 140 grams each. Exotic, unique, unforgettable. Made from the essential oils of Jasmine, Rose, Carnation and Geranium, and then mixed with delicious Spanish olive oil, the Maja line of bath products is a Spanish classic. 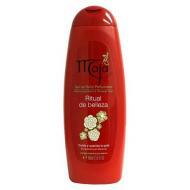 Maja Shower & Bath Gel from Spain, is based on essences of rose, jasmine, carnation and geranium. Once these delicate fragrances have been blended they are added to the Spanish olive oil and the other natural oils, creating a very luxurious shower and bath gel. Ever so exotic. Made in Mexico. Maja Dusting Powder by Myrurgia, fragrant and romantic memories of Spain. Made with the essential oils of Jasmine, Rose, Carnation and Geranium. A classically quintessential Spanish fragrance. Maja Spray Eau de Toilette Perfume 100ml....match it up with the whole line of Maja Shower Gel, Maja Bath Soap, Maja Body Lotion and Maja Dusting Powder. The classic fragrance of Maja is a mysterious blend of rose, jasmine and other flowers. It has been a favorite of sophisticated ladies for over 100 years. Maja Talcum Powder with a shaker top, made in Mexico.